Contact Form 7 is a popular contact form plugin used on WordPress. Many local businesses often turn to Contact Form 7 because of its robust and simplistic features, making it the ideal plugin for WordPress websites of all trades. We’ve often been asked by our clients who run Google AdWords to implement Google AdWords conversion tracking. Conversion tracking allows business owners to measure the success of their campaign by tracking the number of successful leads which come through. It’s interesting to know that most WordPress contact forms actually don’t offer this as a default setting. Many small hacks and plugins often don’t work in fixing this problem. In this post, I’ll explain and thoroughly go through the steps needed to successfully implement Google AdWords conversion tracking with Contact Form 7. Create a thank you page you’d like your prospects to be redirected to after they’ve successfully sent their enquiry. The thank you page will be where your conversion tracking code will be located. Fill the page with a simple and polite thank you message, acknowledging you’ve received their enquiry. For your convenience I’ve included a generic message which you can simply copy and paste. Thank you for contacting us. We’ve received your enquiry and one of our friendly staff members will be in touch with you shortly. 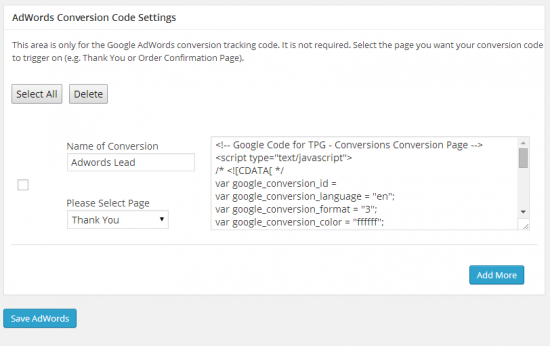 On the left hand side of the WordPress admin interface, install and activate Smart Google Analytics Code. Click onto the plugin settings and scroll towards the bottom of the page where you will find the conversion code settings. Paste in your Google AdWords conversion code into the right-hand box and select the thank you page you previously created. Conversion name can be anything you’d like. Once complete, hit “Save AdWords”. To do this, insert the following code into your theme’s functions.php. To locate the file, navigate your way to Appearance > Editor > Theme Functions (functions.php). Paste in the code below. Edit the above URL to your own. Credits go to maryisead.